Visual aids for macular degeneration help maintain your independence and help you to maximize your useable vision. There are many specialized glasses and large number, large print, or talking aids to assist you in maintaining your independence and to help you continue to do the things they enjoy. It is important that you find ways to adjust and adapt as your macular degeneration progresses. Identify first the activity you want to do and then find the appropriate aid to help - such as telling time. Possible solutions are a large number wall clock or a talking wrist watch. You can continue to do many of the hobbies you find enjoyable - you just have to do them differently with the help of visual aids. Macular degeneration magnifiers, cooking aids, large print books, and electronic reading devices are just a few of the great aids that can help you. 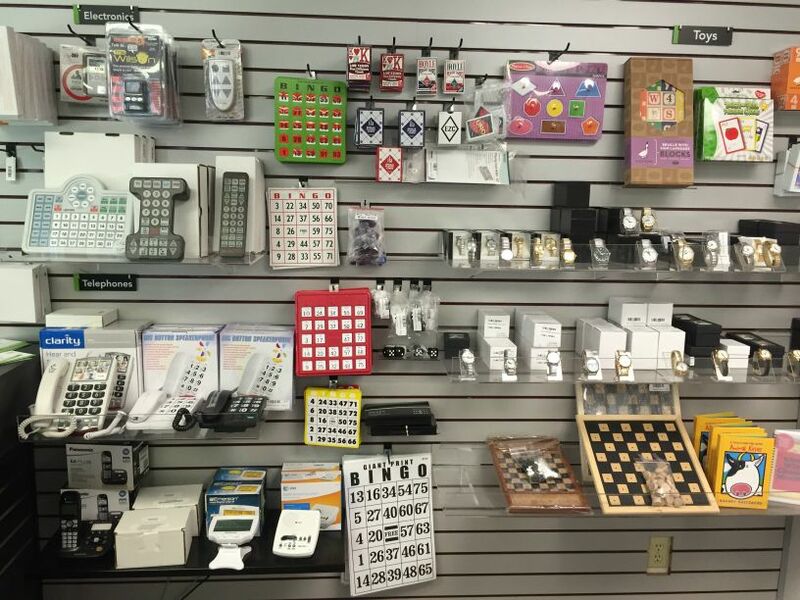 From large button TV remotes to talking calculators, there are solutions to your loss of central vision. If you give up the things you enjoy too easily, a sense of hopelessness and depression can set in. But when you find new ways to read, watch TV, use the phone, cook a dessert, you will feel a sense of accomplishment and independence. Listed below are several low vision solutions that will make everyday living a bit easier. Vision aids for macular degeneration include a variety of gadgets and tools such as magnifiers, lights, bold print books, and contrasting colored measuring cups that allow you to enjoy everyday pleasures such as reading, playing cards, baking, and watching movies. High definition and large screens make today's TV's better than ever for seeing vivid colors and detailed images. However, that beautiful view can still appear blurry to someone with macular degeneration. We bought these television glasses for my father-in-law who has wet AMD in one eye and dry AMD in the other eye. Normally he pulled his chair up really close to his 42" high def TV. Now he can sit farther away from the TV - on the couch at home or at a friend's house and enjoy clear, vivid TV viewing thanks to these distance magnifiers. 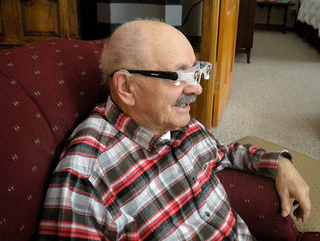 After several months, he says he is still enjoying the clearer vision thanks to the TV glasses. Find out some easy tips to help making TV watching more enjoyable or how to enlarge the screen with TV magnifying glasses. 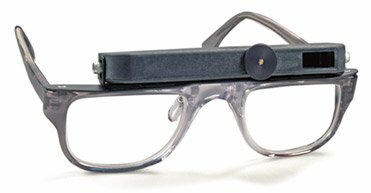 Low vision magnifiers are perhaps the most often used of all aids for macular degeneration. However, there is no one magnifier that is going to be able to help with all of your different reading needs or hobbies. 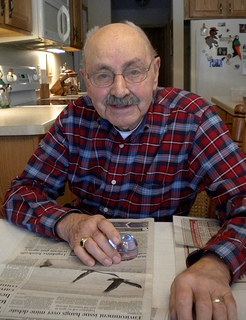 Small pocket magnifiers to full page magnifiers make it possible to check a price tag or read your favorite newspaper. From desk top magnifiers to pocket magnifiers or TV screen magnifiers - there is a magnifier for your every need. Find a task or hobby frustrating because of your limited vision? There is often a solution. Is it hard for you to distinguish the face of your choir director or read road signs or watch TV? Just as there are magnifiers for close up vision there are telescopic lenses for seeing in the distance. And... just like the magnifiers, the type of telescopic device you buy depends on what task you want to use it for. There are hand held monocular telescopes (for use with one eye) and binoculars (for both eyes), as well as telescopes that are mounted to your eye glasses. A prescription may be required, as well as special training from a low vision specialist. Are you finding it difficult to make a phone call because you are having trouble seeing the numbers on your phone? Then find out how you can make this task simpler with larger buttons, bigger numbers and easy speed dialing. 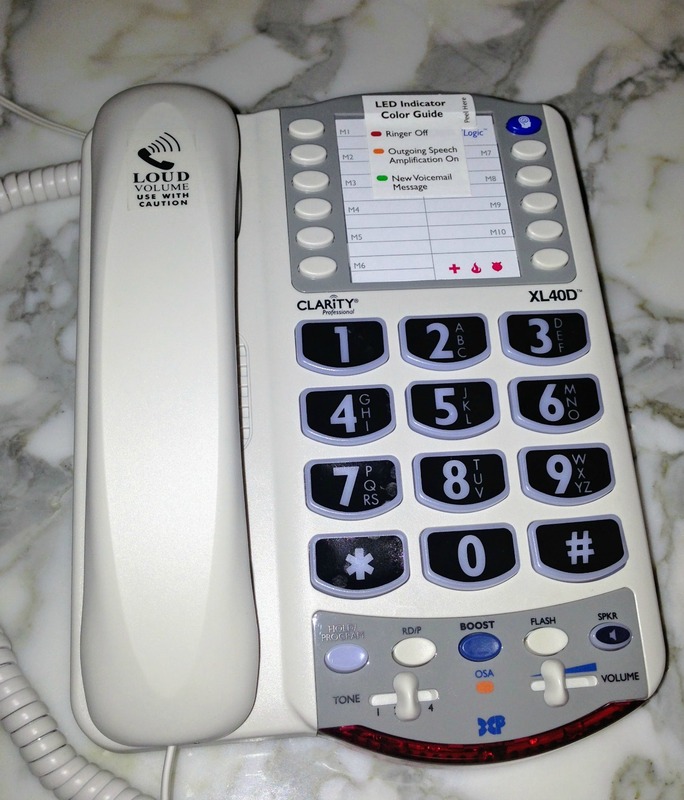 You can also get talking caller ID and amplified sound for those who are hard of hearing. If you are over the age of 50 and for sure if you have macular degeneration, reading the numbers on an average watch is difficult at best and usually not even possible - especially in low light. 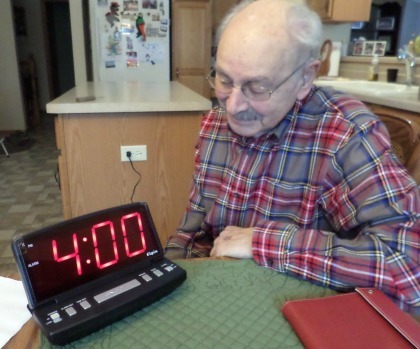 One of my father-in-law's favorite low vision aid is his talking wrist watch. He just presses a button and holds the watch up near his ear to hear the time. 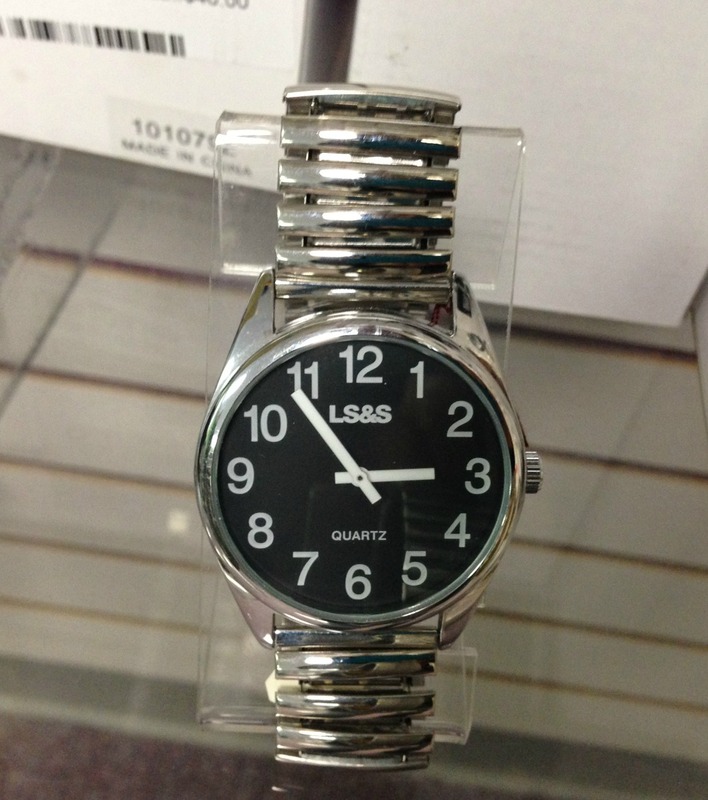 The watch also has large numbers with dark black numbers on a crisp white background for better visibility. Want to know what time it s when you wake up in the middle of the night? A large number clock with a black background and contrasting red numbers can be visible often from a distance. Talking clocks announce the time and will often have large number displays so the numbers are easy to see. You may want to know about some special features, like clocks that tell you what time it is or ones that display the month and date, before you make your purchase. Don't let macular degeneration keep you from writing. The most important tip is to have a gooseneck or adjustable lamp on your desk so that the light can be directed onto your paper. 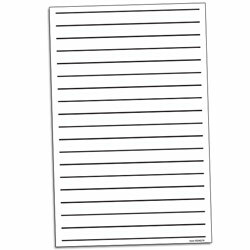 Use wide lined paper that has a darker and thicker line which is easier to see and follow. 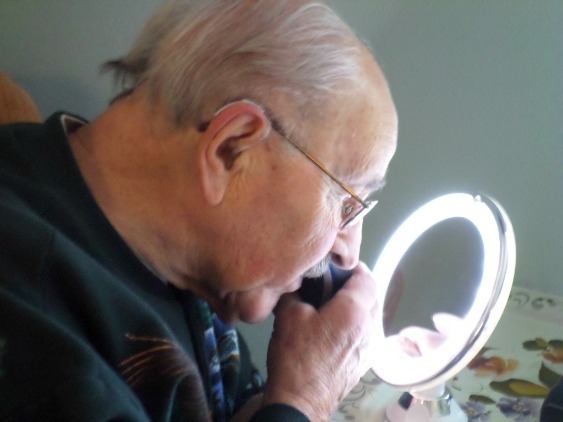 A lighted magnifying mirror and an electric razor is a winning combination for my father-in-law. You can continue to keep your own financial records and bill writing with just a few inexpensive visual aids - like large print checks and check register. Large print checks make it possible to pay your own bills and maintain your own finances. Check with your local bank, most of them will offer these checks as one of your options. 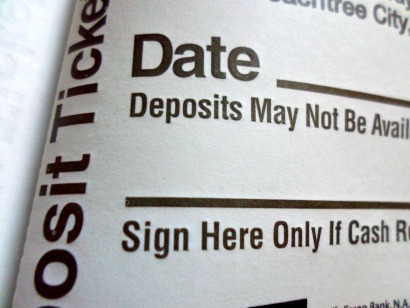 Always keep your checks plain with no designs or graphics for easier viewing. You may have found yourself reading less and less - because it does take more effort to read with macular degeneration. Get large print books from your library or book store. 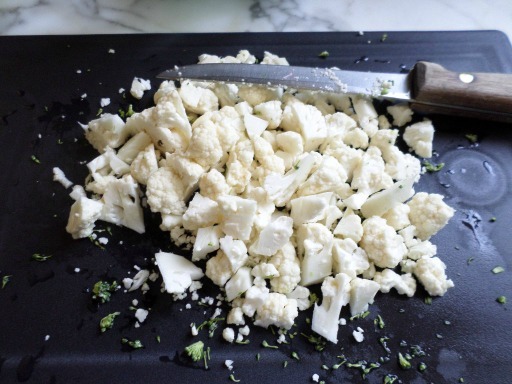 Macular degeneration aids for the kitchen include large number measuring cups, voice activated timers, pre-packaged food, and contrasting cutting boards. With some tips and strategies you can continue to make your own meals or entertain others in your home. Many of these low vision kitchen gadgets are very affordable and easy to use. Macular degeneration glasses for magnifying distance is just as important as magnifiers for close up tasks. These glasses can be used for watching movies, enjoying a play, admiring your grandchild's face, golfing, gardening - really any activity where you need something several feet away to be magnified. 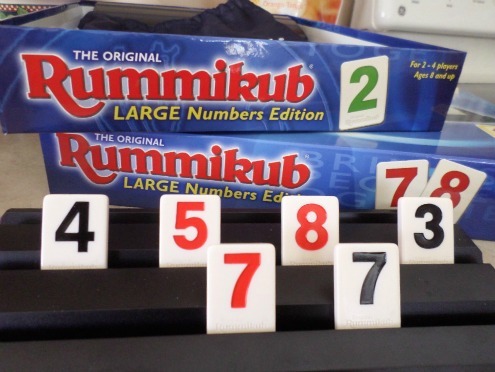 Have you become concerned that your friends no longer want to play cards with you because you are having difficulty seeing your cards? Don't let macular degeneration slow you down. Find ways to adjust - this one is an easy one. Buy low vision playing cards with bold, bright colors. Remaining actively involved in activities that stimulate the mind while enjoying the company of friends - whether it is with your local bridge club or playing poker with the guys - is vital to your emotional and mental health. Visual aids for macular degeneration don't need to be high tech. They can be as simple as a calendar that uses bold, large print with lots of space to write down appointments. 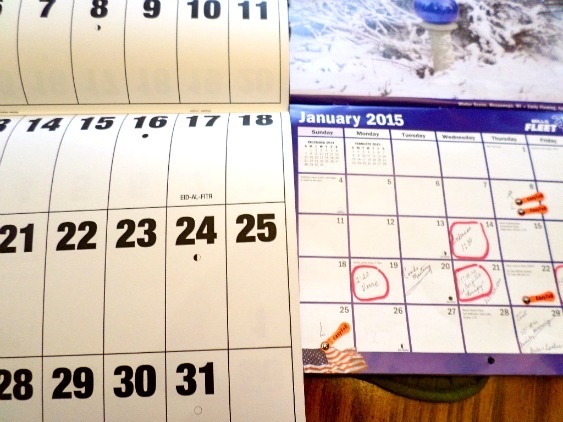 You can still write down your appointments and birthday reminders on a large print calendar. There is plenty of space to use a black 20/20 Pen so that it is easily readable as well. You can see how this big print calendar uses big bold numbers to make it easier to see for those with age related macular degeneration (AMD). A talking scale automatically turns on when you step on it and will speak in pounds or kilograms. These scales can be one of many vision aids for macular degeneration. A clear, understandable voice will state your weight so that you don't have to struggle to read the numbers. However, they usually have a large number display as well for easier reading. They are battery operated. Some of them offer the option of turning on or off the talking feature. A talking scale makes it possible to manage and monitor one's weight by listening to a voice that reports one's weight in pounds or kilograms. 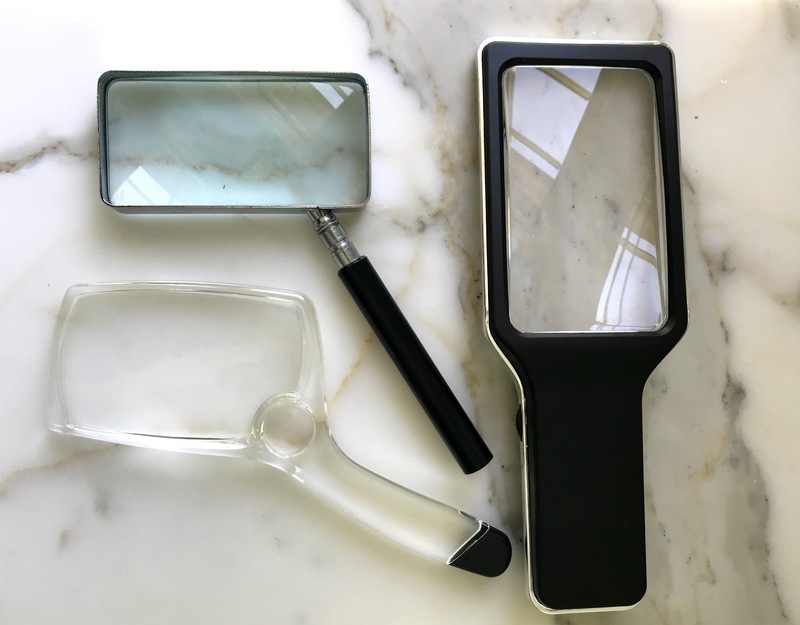 Visual aids for macular degeneration are most often specific to a task - such bioptic telescopes for watching TV, page magnifiers for reading the newspaper or large number phones for easier dialing. For people with AMD, there is a visual aid for almost every task. Adjusting to this visual impairment by using vision aids will reduce frustration and provide a sense of independence.